French game company Ubisoft has turned early American history into an age of booty. Over the past two years, the company has used early American history as the backdrop for three successive and successful titles in their Assassin’s Creed franchise: Assassin’s Creed III, Assassin’s Creed III: Liberation, and Assassin’s Creed IV: Black Flag. The most recent of these titles, Black Flag, is set in the Golden Age of Piracy during the early eighteenth century, and is easily the most profitable and well received of the three. Critics and players have praised Black Flag for its gameplay, graphics, and music—or rather, sea shanties. But the biggest reason why this game has garnered accolades and high sales is because of its use, or misuse, of history. More than any other Assassin’s Creed game, Black Flag plays fast and loose with the historical record. It skews away from accuracy in favor of fun at almost every turn. Yet even as Black Flag thumbs its nose at the concerns of academic history, it nevertheless succeeds, perhaps better than any previous title in the series, in giving players a sensibility of the age. 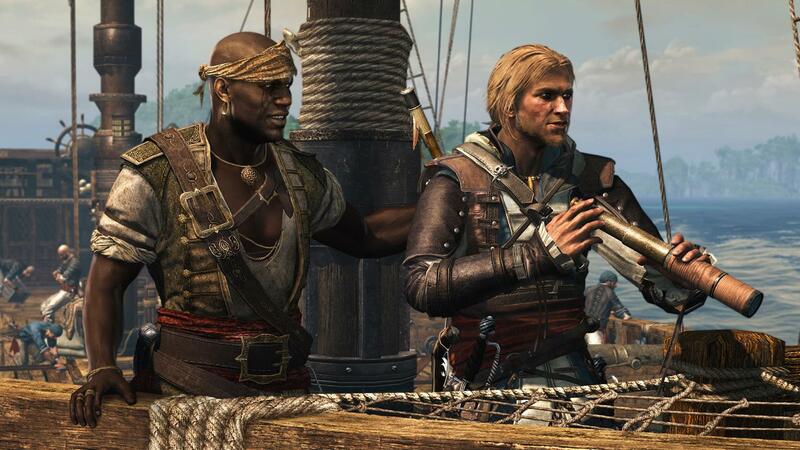 In Black Flag players assume the role of Edward Kenway, a Welsh sailor attempting to make a fortune in the Caribbean during the Golden Age of Piracy. Originally a privateer serving England, Edward decides to switch to piracy sometime in 1713. Though most of his narrative becomes embroiled in the game’s fictional struggle between the Assassins and the Templars, Edward’s background fits in well with the historical record. The Golden Age of Piracy began following the end of the War of the Spanish Succession, also known as Queen Anne’s War, when there were too many sailors left over from the conflict and not enough employment to keep them satisfied. Many of these men turned to piracy to make a living. According to the economist Peter Leeson, in any one year between 1716 and 1722 between 1000 and 2000 pirates infested the waters of the Atlantic Ocean, the Indian Ocean, and the Caribbean. While this estimate does not seem like a huge number, it is quite substantial given that the Royal Navy only employed 13,000 sailors in any year between 1715 and 1726. 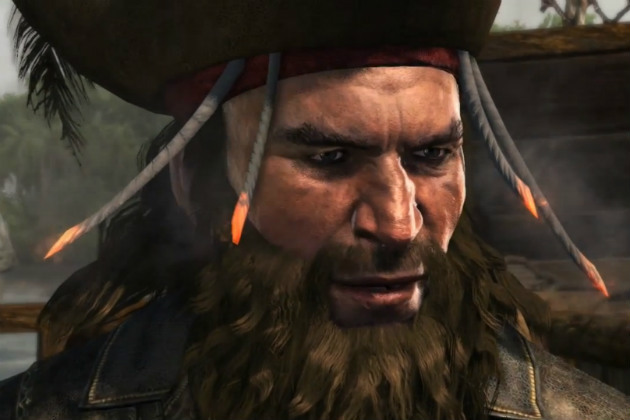 Through Edward’s story, players come across a number of the more famous or infamous of these sea bandits: Edward Thatch (Blackbeard), Calico Jack Rackham, Charles Vane, Benjamin Hornigold, Mary Read, and Anne Bonny. With the help of this rogues’ gallery, players can engage in a number of pirate activities, including drinking, treasure hunting, and boarding ships. Ship boarding, the most entertaining and profitable of these activities, requires players to first equip and supply Edward’s brig, the Jackdaw. Players are also tasked with assembling and maintaining a crew for the vessel. The Jackdaw’s crew features an accurate cross section of Caribbean life for the period in question. Most Golden Age pirates came from seafaring backgrounds with a majority calling Britain home. England provided roughly 35 per cent, Scotland 10 per cent, and Wales 8 per cent of Golden Age pirates. The American colonies were home to 25 per cent with 20 per cent being West Indian and the remainder hailing from Sweden, the Netherlands, France, Spain, Portugal, Greece, and India. The most striking feature of this composition is the number calling the West Indies home. Many of these West Indians had actually been slaves at one point in time, like Edward’s Quartermaster Adéwalé. In fact, during the Golden Age somewhere between 25 and 30 per cent of all pirate crews were of African descent. For example, in 1717 Blackbeard’s crew was 60 per cent African. Ubisoft has done their research on this count. There are plenty of examples, however, of Black Flag willfully going off course from the historical record. This is most apparent with the game’s depiction of violence. Even though Edward’s story includes copious amounts of violence, most real life pirates were no more violent than the rest of the population in the early eighteenth century. As much as it may disappoint fans of pirates everywhere, most pirates were actually trying to avoid violence. For instance, Blackbeard went to the trouble of placing fuses or matches under his hat, which appeared on each side of his face. Blackbeard lit these when approaching a target. The idea was to give off such a terrifying appearance that no one would dare to resist. After all, resistance meant that pirates could be killed in the action and their ship(s) and the one they targeted might be damaged, reducing the profitability of the raid. Blackbeard’s preparations apparently worked as he supposedly never killed a man. In addition to the game’s violence, there are even more inaccuracies relating to the game’s ambient surroundings. For instance, many of the game’s locations include buildings that did not exist at the time. Black Flag’s Nassau comes complete with the Queen’s Staircase (1794), while the in-game version of Havana includes the Cathedral of the Virgin Mary of the Immaculate Conception (1777). Ubisoft developers provide an explanation for these anachronisms in the game’s database, arguing for their inclusion on the basis that these buildings are “cool,” “beautiful,” and, most importantly for Assassin’s Creed, “climbable.” The “coolness” factor also seems to have played a role in the selection of some of the game’s shanties, namely “Drunken Sailor” (~1850), “Johnny Boker” (~1840), and “Spanish Ladies” (1796). The game’s list of anachronisms also includes collectable documents and artifacts. Players, for instance, can hunt down drawings by Athanasius Kircher or pages of the then missing Voynich manuscript, claimed by the game to be part of a collection held by Jamaican planter Peter Beckford. Unquestionably the biggest inaccuracy of the game is an omission—the eighteenth century Caribbean of Black Flag is completely without a French presence. Although Black Flag’s downloadable content, Freedom Cry, takes place in French held Saint-Domingue, the main game includes nary a French soul. Picking out the anachronisms and inaccuracies of Black Flag, however, is as easy as it is pedantic. The developers themselves embrace this criticism, arguing within the game’s database that they are trying to make a product that is entertaining rather than one that will live up to the standards of “oily, humorless university professors.” As oily but not so humorless university professors, we feel that Ubisoft made the right choice—not only for Black Flag, but for history as well. Anachronisms and inaccuracies are part and parcel to any historical fiction, regardless of the medium. What allows us to forgive Assassin’s Creed for these transgressions is the fact that the series uses history to push popular consciousness in positive directions. To be sure, the game includes inaccuracies, but it also provides a popular means for millions of players around the world—many of whom would never dream of picking up a book—to interact with the past. Black Flag also makes good use of the in-game database to make players aware of historical discrepancies when they occur. These database entries are not perfect, but they provide a basis of knowledge that can be added to later by reading or, perhaps, by an oily professor. Most importantly, the recent early American entries in the Assassin’s Creed franchise are exposing players to a wider array of historical experiences and narratives. This can be seen in Black Flag’s downloadable content, Freedom Cry, where players take the role of Adéwalé, an escaped Trinidadian slave that fights to help the Maroon community in Saint Domingue. In a similar vein, the soon to be rereleased Assassin’s Creed III: Liberation follows the adventures of Aveline de Grandpré, a female French-African in eighteenth century New Orleans. Where else, but in these games, can you find popular historical fiction that places the consumer in the role of a slave or black female protagonist? Regardless of your opinion on video games, the exposure of players to these sorts of experiences and narratives has to be seen as a net positive. The success of Black Flag ensures that the Assassin’s Creed franchise will continue, and we hope that this continuation will result in games that are both fun and historically adventurous. Peter Leeson, The Invisible Hook: The Hidden Economics of Pirates (Princeton: Princeton University Press, 2009), p. 9. Leeson, The Invisible Hook, 8-9. Kenneth J. Kinkor, “Black Men under the Black Flag,” in C. R. Pennell, ed., Bandits at Sea: A Pirate Reader (New York: NYU Press, 2001), p. 201. This is great. Thanks, Bryan and Robert, for contributing it here. I watched my teenage brothers-in-law play the game over the holidays, and came away both impressed with the portrayal of the 18th century Caribbean landscape and a bit annoyed with the several historical inaccuracies you all note (no French? Huh?). I wonder if you all can speak to what pedagogical function, if any, games of this sort might have. Would it be appropriate to create an assignment involving the game (in the same way a professor might assign students to read a historical fiction novel), and is so, how might that look? Thanks for your comment. Bryan may be the better person to respond about pedagogy, since he’s the one that teaches on piracy, but I’ll take a stab at your question. I feel strongly that games can be assigned in lieu of a novel. I think they present historical themes no better or worse than other forms of historical fiction, and they have the added benefit of being interactive – which typically means students will actually engage with the material. What I’ve done in US history survey courses is to assign free games (e.g. old versions of Oregon Trail or Civilization) and have the students play chosen segments of these games as a group assignment. For Oregon Trail, for instance, I ask the groups to make it as far as they can on the trail without losing anyone in their party (nearly impossible). Along the way, I ask the groups to write down inaccuracies or omissions from the history that we’ve studied in class or in reading assignments. I’ve only done this for a couple of semesters, but it seems to work pretty well. The videos have been a hit with gamers, but I would really like some feedback from historians about how to improve the series. What’s really encouraging is that most of the comments from gamers ask for more historical content in the videos. This is a great blog segment. Thank you for such a fascinating look at Assassin’s Creed. We are hoping that you’ll follow up with a review of the game’s basic theme of the Assassin’s and the Knight’s Templar. We have heard about the plot but have no other knowledge of the plot’s details. Our thanks to Ubisoft for making the investment in this area of history. One small correction — “…nary a French soul” is inaccurate. The first Templar Edward kills, part of the original Triumvirate in Havana, is Julien du Casse… a frenchman and fictional cousin to Jean du Casse. I am a history student and a fan of this game series and I have to say…this is an awesome blog topic. Some fellow fans of the game and I had a discussion over your article recently and found it very engaging. Thank you for writing this. An interesting and entertaining review. Once Instarted playing AC4, I became quite enamoured with the “pirate role playing” aspect of the game (who wouldn’t like to sail the seas plundering booty and getting drunk on the proceeds? ), and although I never go into an Assasin’s Creed game with the expectation of historical accuracy, it does, as you say, inspire further reading about the colourful characters that inhabited this fascinating niche of history.